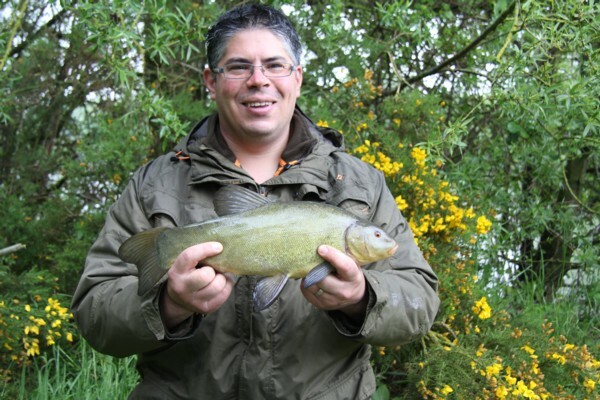 Tony’s wife had contacted me some time ago asking whether I could show him how to catch tench. Now after reading my previous blogs where for 6 days I had blanked and hadn’t had even a slight nibble I was thinking this is going to be difficult. One of the benefits of being a guide is that venues can be found to match the customers requirements or goals. Tony’s was to catch tench! 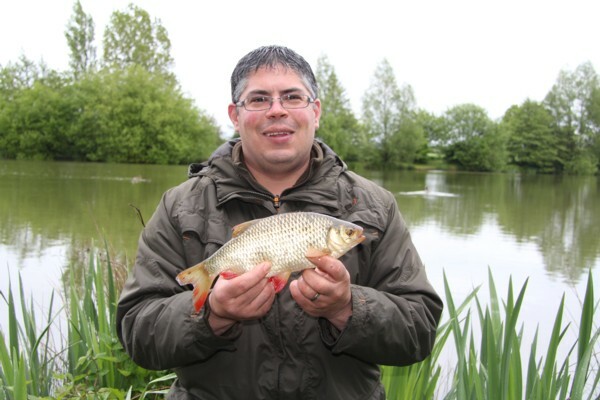 He was on holiday in the Cotswold Water Park so he was surrounded by lakes holding tench. 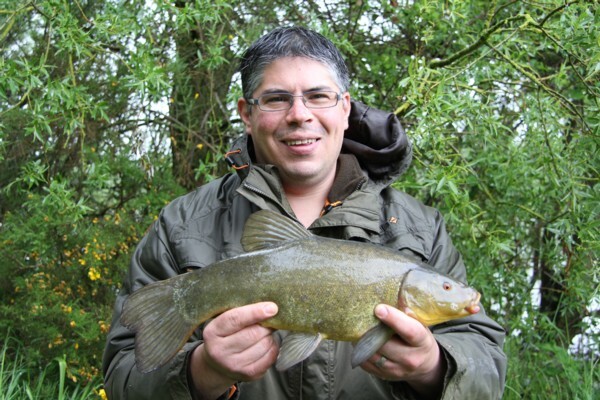 I had been trying to catch some huge tench from very large waters and it was going to be a bit hit or miss. Misses was the current situation. So the lake I chose was a small 8 acre gravel pit that produces tench to 8lbs, plus some large rudd and roach to over 2lbs. So I picked Tony up from his hotel at 6.30am and we drove to the lake. There was rain in the air as we arrived so I quickly put up the shelter for the day and went about setting up the tackle. The main method was to be the trusted method feeder with casters in the mix and with plastic ones on the hook. 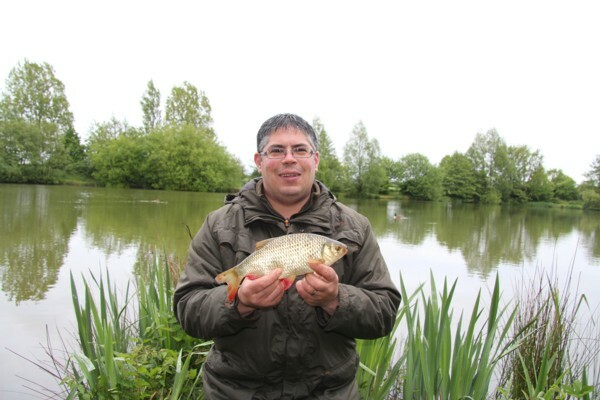 The lake is full of little perch, roach and rudd and so using the plastic ones ensured that the bait stayed there after the attentions of the these smaller fish. One of the rods had a maggot feeder and a helicopter rig and 3 red maggots on a size 16 hook. In the method mix I had dead red maggots and casters. A few balls were thrown out while we set everything up. By 7.30am it began to rain harder. Once the rods were cast out the action came very quickly with little perch being caught on the maggot feeder rod. The indicators would rap up against the rod and then drop back again a sure sign that the perch were the culprits. Soon though a steady yo-yo take resulted in a small roach of about 6oz. The rubber caster rods were also getting the perch treatment with jerky takes. Most of the time the perch would feel the weight of the feeder and drop them. Occasionally though one would hang itself. It was turning into a dreadful day with continuous rain hammering down on the shelter. Although the tench and carp were bubbling and fizzing over our baited area though and sure enough soon Tony was playing a lovely tench of just over 3lbs. So that was it mission accomplished and the pressure was off. A steady stream of perch roach and rudd continued to find their way to the net. Now I don’t know about you but I just don’t like fishing with a coat on however with the incessant rain it was a necessity. There was no wind at all to blow the clouds away. The benefits was that we could see every movement on the lakes surface. Tea was made every couple of hours to keep us warm, yes it was only 10c because of the rain and evaporation. We saw a few large carp leap from the water in a playful manor on the far side of the lake. Time continued to pass unlike the rain that just hung around all day. More tench came to the plastic caster rods. There would be a bleep from the alarm and then the reel spools would click away nicely as the tench paddled off. It was great fun! The largest tench of the day was just over 4lbs. They were thin little things that needed to feed ready for spawning. A sure sign that we had had the coldest spring for 50 years and the tench had fed little. Tony also hooked a nice little common carp of just over 4lbs that fought really well. They do grow to almost 30lbs in the lake however they are rarely fished for. Towards the later part of the day Tony caught a beautiful rudd of 1lb 6oz. So at 8.15 pm with the rain stopping we started to pack up, we had caught a good few perch, roach,rudd and 8 lovely looking tench. Oh and not forgetting the carp. A very enjoyable day it was. This entry was posted on Sunday, June 2nd, 2013 at 10:29 am	and is filed under Uncategorized. You can follow any responses to this entry through the RSS 2.0 feed. Both comments and pings are currently closed.